Cover Story is a game about pure imagination. The purpose is to think expansively around an ideal future state for the organization; it’s an exercise in visioning. The object of the game is to suspend all disbelief and envision a future state that is so stellar that it landed your organization on the cover of a well-known magazine. The players must pretend as though this future has already taken place and has been reported by the mainstream media. This game is worth playing because it not only encourages people to “think big,” but also actually plants the seeds for a future that perhaps wasn’t possible before the game was played. 1. 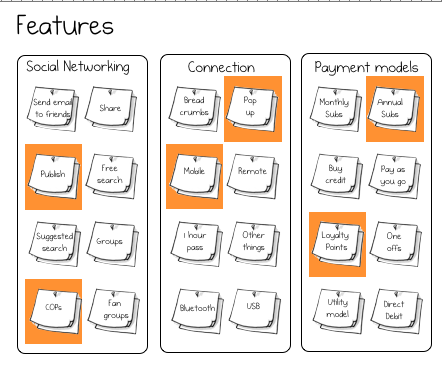 Before the meeting, draw out large-scale templates that include the categories shown on the following image. Your template doesn’t need to look exactly like this one; you can be creative with the central image and the layout. Just be sure to keep the categories intact. The number of templates you create depends on the size of the group. At the most, allow four to six people to work on one template together. • “Cover” tells the BIG story of their success. 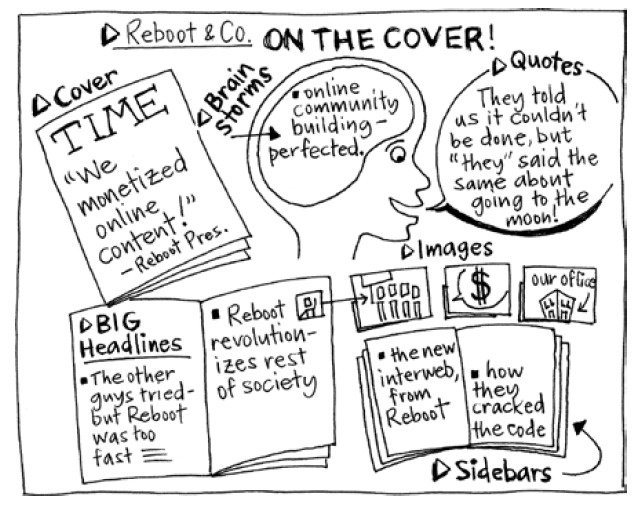 • “Headlines” convey the substance of the cover story. • “Sidebars” reveal interesting facets of the cover story. • “Quotes” can be from anyone as long as they’re related to the story. 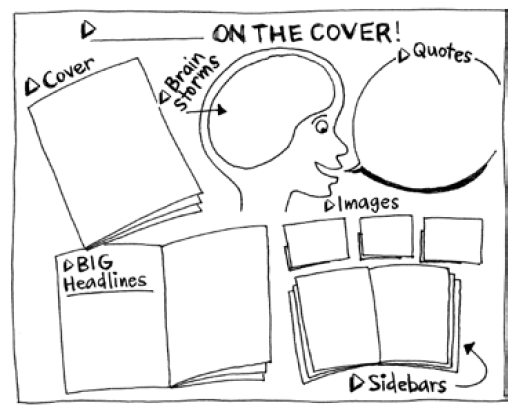 • “Brainstorm” is for documenting initial ideas for the cover story. • “Images” are for supporting the content with illustrations. 3. Break the players into groups of four to six and make sure there are markers and one template for each group. Tell the players that to populate the template they can either select a scribe or write and draw on it together. 4. Ask the players to imagine the best-case scenario for their company and to take that scenario one step further. Request that they spend five quiet minutes imagining their own stories before they work together to agree on one. Give the groups 30–45 minutes to generate this “story of the year” and represent it on their template. 5. 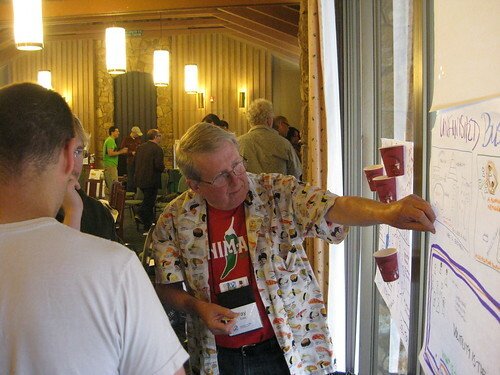 Reconvene the breakout groups and ask for volunteers to present their visions first. Give each group 5–10 minutes to share what they imagined was written in the story and the supporting elements. 6. Note any common vision themes and areas of agreement. Ask for observations, insights, and concerns about the future state. Optional activity: Ask two players to role-play an interview based on the content from their “On the Cover” template, as though the magazine sent a reporter to interview an important character in the story. This game is about the wildest dream for the organization—that has already happened! So, when you set up this game as the meeting leader, speak about their “successes” with enthusiasm and in the past tense. Encourage the players to use the past tense in their brainstorming and story creation. And don’t let the group go into analysis mode. This game is not about logic, pragmatism, or parameters. Cover Story is an open-ended, creative-thinking exercise, so tell the players to be wary of any “reality checks” from other players. And as the small groups present their visions to the large group, note and discuss any common themes that arise. These themes—however fantastical—are telling, because commonalities reveal shared hopes and also plant seeds for real possibilities. If this play is part of a longer group process, post these visions around the room so that they serve as reference points for continued ideas and inspiration. Here is another image of the Cover Story Game. But this one is special – clicking on this image will start an “instant play” game at www.innovationgames.com. In this game, there will be a set of light bulb icons that you can drag on your online Cover Story to capture your big ideas. We’ve organized this game so that the regions will capture where you’ve placed each of your awesome ideas. We don’t truly have a good grasp of a situation until we see it in a fuller context. 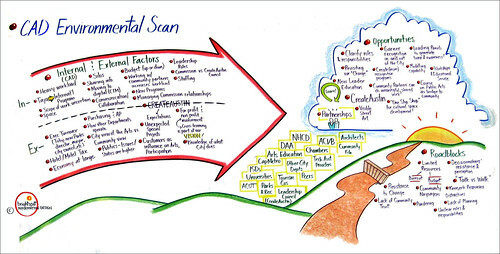 The Context Map is designed to show us the external factors, trends, and forces at work surrounding an organization. Because once we have a systemic view of the external environment we’re in, we are better equipped to respond proactively to that landscape. Context Map, originally uploaded by dgray_xplane. 1. 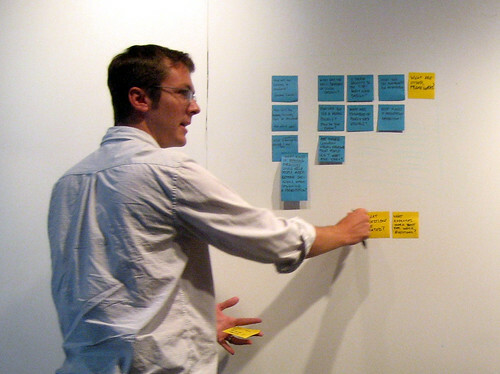 Hang six sheets of flip-chart paper on a wall in a two-row, three-column format. 2. On the top-middle sheet of flip-chart paper, draw a representation of the organization under discussion. It can be as simple as an image of your office building or an image of a globe to represent a global marketplace. Label the picture or scene. 3. On the same sheet of paper, above and to the left of the image, write the words “POLITICAL FACTORS”. Above and to the right, write the words “ECONOMIC CLIMATE”. 4. On the top-left sheet of flip-chart paper, draw several large arrows pointing to the right. Label this sheet “TRENDS”. Include a blank before the word TRENDS so that you can add a qualifier later. 5. On the top-right sheet of flip-chart paper, draw several large arrows pointing to the left. Label this sheet “TRENDS”. Again, include a blank before the word TRENDS so that you can add a qualifier later. 6. On the bottom-left sheet, draw large arrows pointing up and to the right. Label this sheet “TECHNOLOGY FACTORS”. 7. 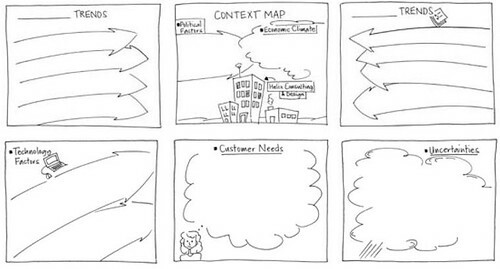 On the bottom-middle sheet, draw an image representing your client(s) and label the sheet “CUSTOMER NEEDS”. 8. On the bottom-right sheet, draw a thundercloud or a person with a question mark overhead and label this sheet “UNCERTAINTIES”. 9. Introduce the context map to the group. Explain that the goal of populating the map is to get a sense of the big picture in which your organization operates. Ask the players which category on the map they’d like to discuss first, other than TRENDS. Open up the category they select for comments and discussion. Write the comments they verbalize in the space created for that category. 10. Based on an indication from the group or your own sense of direction, move to another category and ask the group to offer ideas for that category. Continue populating the map with content until every category but TRENDS is filled in. 11. The two TRENDS categories can be qualified by the group, so take a quick poll to determine what kinds of trends the players would like to discuss. These could be online trends, demographic trends, growth trends, and so forth. As you help the players find agreement on qualifiers for the trends (conduct a dot vote or have them raise their hands if you need to), write those qualifiers in the blanks next to TRENDS. Then continue the process of requesting content and writing it in the appropriate space. 12. Summarize the overall findings with the group and ask for observations, insights, “aha’s,” and concerns about the context map. It’s up to the players to paint a picture of the environment in which they sit, but as the meeting leader, you can help them generate content by asking intelligent and thoughtprovoking questions. Conduct research or employee interviews before the meeting if you need to. The idea is to portray a context that is as rich and accurate as possible so that the players gain insight into their environment and can subsequently move proactively rather than reactively. 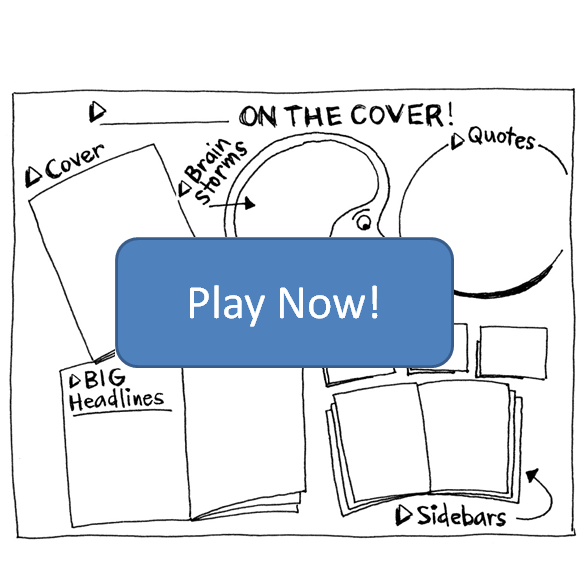 The players can populate the categories other than TRENDS on the context map in any order, so note their starting point and pay attention to where they focus or generate the most content—both can indicate where their energy lies. But keep in mind that this activity is designed to generate a display of the external environment, not the internal one. So, if you notice that the discussion steers toward analyzing the internal context, guide them back to the outside world. There are other games for internal dynamics. 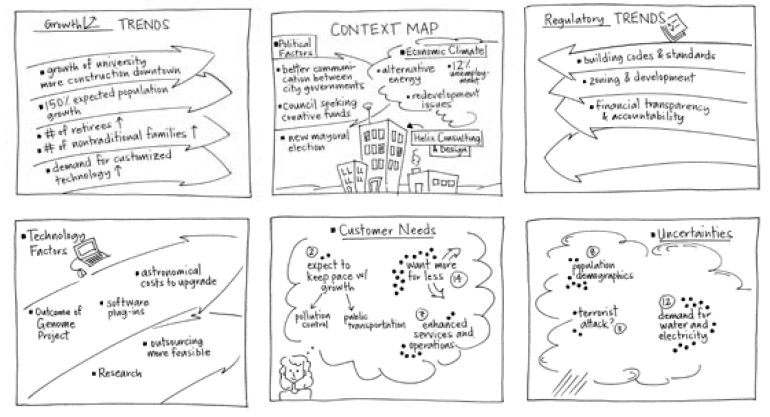 The Context Map game should result in a holistic view of the external business landscape and show the group where they can focus their efforts to get strategic results. This game is based on The Grove Consultants International’s Leader’s Guide to Accompany the Context Map Graphic Guide® ©1996–2010 The Grove. This format for brainstorming compresses the essentials of an ideation session into one short format. The numbers 3-12-3 refer to the amount of time in minutes given to each of three activities: 3 minutes for generating a pool of observations, 12 for combining those observations into rough concepts, and 3 again for presenting the concepts back to a group. Essential to this format is strict time keeping. The “ticking clock” forces spontaneous, quick-fire decisions and doesn’t allow for overthinking. With this in mind, a group that is typically heavily measured in its thought process will benefit the most from this exercise but will also be the hardest to engage. Given its short duration (30 minutes total for 10 participants), 3-12-3 Brainstorming can be used as an energizer before diving into a longer exercise or as a standalone, zero-prep activity. It works equally well in generating new ideas as improvements to existing ones. This is a fast exercise that gets slower as more participants are added. With up to 10 participants working as partners, the speed of the exercise makes it an energy builder. Working beyond 10 may require creating groups of three instead of pairs to keep from getting slowed down. will tomorrow’s television work?” it is best to avoid doing this right away. By focusing on two words that signify the topic, you will aim to evoke thinking about its defining aspects first, before moving into new concepts or proposing solutions. To set up the game, distribute a stack of index cards and markers to all the participants. Everyone should have a fair number of cards available. The game should begin immediately after the rules have been explained. 3 Minutes: Generate a Pool of Aspects. For the first three minutes of the exercise, participants are asked to think about the characteristics of the topic at hand and to write down as many of them as they can on separate index cards. It may accelerate the group’s process to think in terms of “nouns and verbs” that come to mind when thinking about the subject, or to free-associate. As in all brainstorming, no filtering should be put on this phase, in which the goal is a large pool of aspects in a small window of three minutes. 12 Minutes: Develop Concepts. At this point the group is divided into pairs. Each team draws three cards randomly from the pool. With these as thought starters, the teams now have 12 minutes to develop a concept to present back to the larger group. If the two topic words are sufficient to explain the challenge, the clock starts and the teams begin. 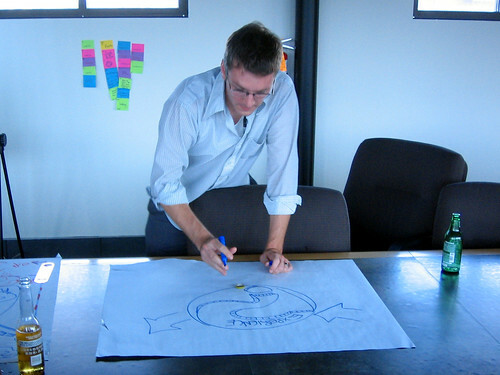 If there is any doubt, reveal a more fleshed-out version of the topic’s focus, such as “How will we become more energy-efficient next quarter?” In developing concepts to present, teams may create rough sketches, prototypes, or other media—the key is in preparing for a short (three-minute maximum) presentation of their concept back to the group. 3 Minutes: Make Presentations. When presenting to the larger group, teams may reveal the cards that they drew and how the cards influenced their thinking. Again, tight time keeping is critical here—every team should have a maximum of three minutes to present their concept. After every team has presented, the entire group may reflect on what was uncovered. Speed is key. 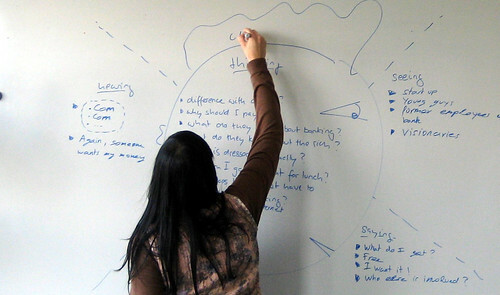 Many traditional brainstorming techniques can be slowed down or fouled entirely when time is not of the essence, despite the best intentions of participants. Additionally, speed helps prove the value of what can be accomplished in short bursts—often the important aspects of good ideas can be captured very quickly and do not require laborious discussion before first coming to light. After presenting concepts back to the group, teams may do a number of things. They may dig deeper on an individual concept or try to integrate the ideas into each other. They may vote or rank the concepts to decide on which to spend more time developing. Often, concepts coming out of this exercise are more memorable to the participants, who are bonded in the time-driven stress of creating together. The 3-12-3 Brainstorm game is credited to James Macanufo. The objective of this game is to identify stakeholders and clarify goals. Who do you want to do what? Almost any endeavor of substantial impact requires seeking help from others. 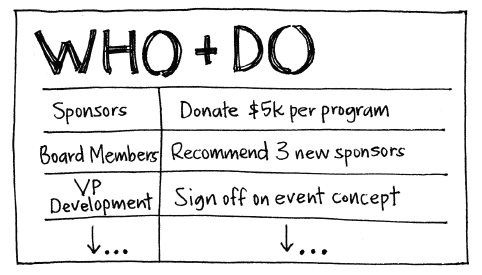 Developing a WHO + DO list is a simple way to scope out the undertaking. 1. Start with the vision. Write out or visualize the big goal. 2. Draw a two-column matrix and write “WHO” on the left and “DO” on the right. 3. Ask: Who is involved in making this happen? Who is the decision maker? Who has needed resources? Who may be an obstacle? Whose support is needed These individuals or groups are your list of WHOs. 4. The DOs are often harder. For each WHO, ask: What do they need to do, or do differently? What actions will build toward the big goal? Sharpen each WHO in the list until you have a desired and measurable action for each. Given all of the possible WHOs and DOs, which are the most important? Who comes first? Bias yourself toward action. When brainstorming DOs, there is a tendency to slip into the easier mode of “we just want them to understand.” Most often when you want people to understand something, it’s because you want them to change something or learn something that they can then “DO.” Ask yourself, or the group, “What will happen once they understand?” Don’t shortchange what you are really looking for: action. 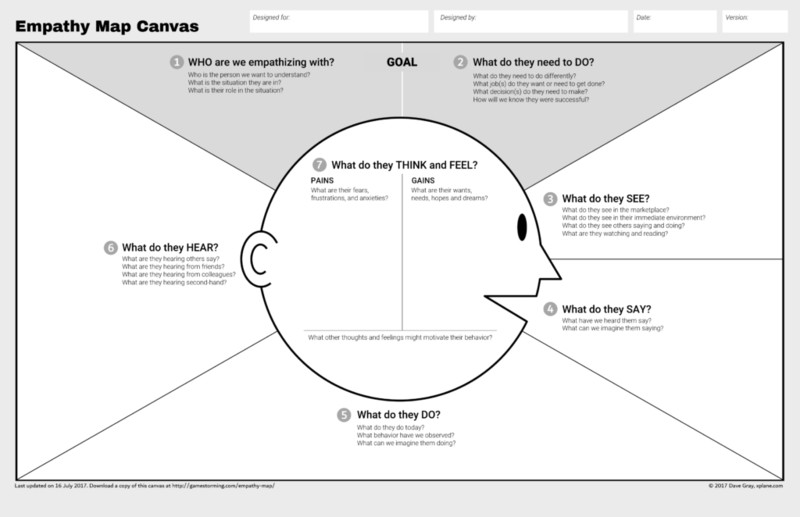 A natural follow-on to this activity is to make an Empathy Map of the WHOs. The WhoDo game is credited to Dave Gray. VTS, originally uploaded by dgray_xplane. This game asks players to envision and describe an ideal future in sequence using words and pictures. Storyboarding as a technique is so versatile that it can be used to show any topic, not just an ideal future. But it is particularly powerful as a visioning exercise since it allows players to imagine and create possibilities. The players tell a story with a happy ending, planting tiny seeds for a different future. You can also use storyboarding to let employees describe their experience on a project, to show approaches to solving a problem, or to orient new employees on policies and procedures—its uses are limited only by the imagination. Before the meeting, determine the topic around which the players will craft their “ideal” story. Once the meeting starts, divide the group into pairs or groups of three or four, depending on the size of the group. Provide markers, pads of flip-chart paper, and stands. 1. Tell the players that the purpose of this game is to tell the other players a feel-good story. The topic of the story is “The Ideal Future for [blank]”—for a team, a product, the company, whatever you decided beforehand. 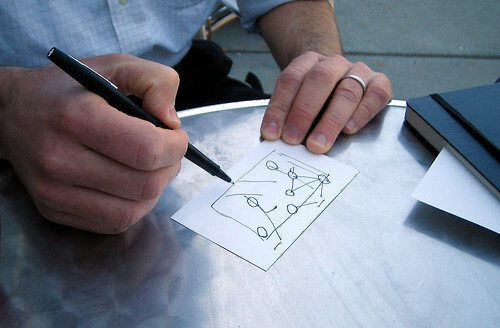 The players’ assignment is to visually describe the topic and narrate it to the group. 2. After the groups are established, give them 20–25 minutes to (1) agree on an ideal state, (2) determine what steps they would take to get there, and (3) draw each step as a sequence of large images or scenes, one per sheet of flip-chart paper. 3. Give the players a two-minute time warning, and once the time is up, bring them back together. Ask for volunteers to tell the story first. 4. After all the groups have presented, ask them what’s inspiring in what they heard. Summarize any recurring themes and ask for observations, insights, and “aha’s” about the stories. 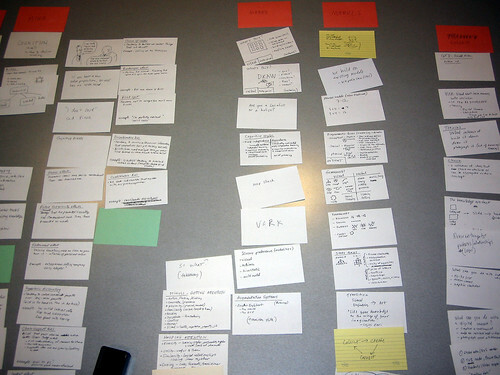 Alternative: Have individuals draw their storyboard images on large stickies. As the leader of this game, be sensitive to the fact that many of the meeting participants will freak when you tell them that large-scale drawing is involved. Reassure them that the story is the point of the exercise and that the images play a supporting role. They can use words as captions to clarify the images and they can also select the “artist” within their group so that not everyone has to put marker to paper. (But it’s more fun for those who do.) Finally, remind them that they aren’t allotted sufficient time to create a da Vinci anyway, so stick figures work perfectly well. For the presentation format, there are various options. Breakout groups can post each sheet of flip-chart paper in a row around the room and walk along the row as they tell the story. They can also leave the flip-chart pad intact and flip the pages over the stand as they narrate. They could choose to hang the sheets in rows and cover them, using one group member to act as a “Vanna White” and create a series of voilà moments. Tell them to have fun with it—they won’t be graded on their stories (although you could make it a contest if it’s that kind of crowd). The process of creating and sharing the stories is what matters. Walt Disney is credited for this activity. His need to animate Steamboat Willie in 1928 led to the process of storyboarding—a story told in sequence on a wall covered with a special kind of board. He found it to be an effective way to track progress and improve a story. Post-up, originally uploaded by dgray_xplane. The goal of this game is to generate ideas with silent sticky note writing. There are many ways to work with ideas using sticky notes. Generating ideas is the most basic play, and it starts with a question that your group will be brainstorming answers to. For example: “What are possible uses for Product X?” Write the question or topic on a whiteboard. Ask the group to brainstorm answers individually, silently writing their ideas on separate sticky notes. The silence lets people think without interruption, and putting items on separate notes ensures that they can later be shuffled and sorted as distinct thoughts. After a set amount of time, ask the members of the group to stick their notes to the whiteboard and quickly present them. If anyone’s items inspire others to write more, they can stick those up on the wall too, after everyone has presented. 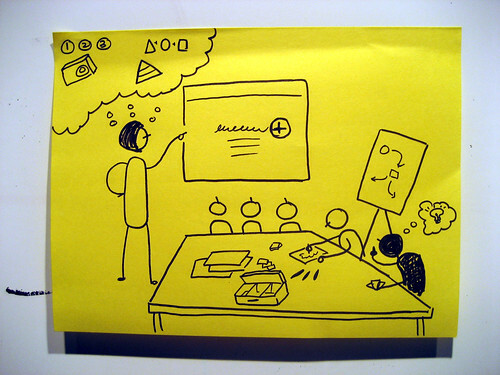 When doing a post-up activity with sticky notes in a workshop, you may want to use the FOG method: mark each note with F (fact), O (opinion) or G (guess). It’s such a simple thing to do, but it adds a great deal of clarity to the decision-making process. Generating ideas is an opening activity, and a first step. 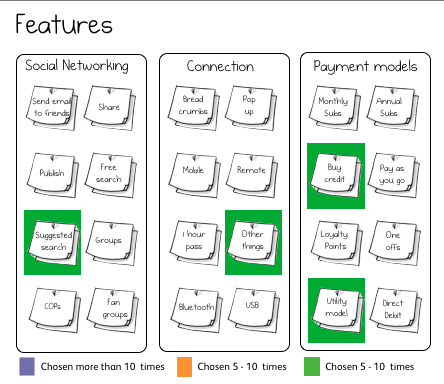 From here you can create an Affinity Map or further organize and prioritize the thoughts, for example using Forced Ranking. Bodystorming is simply brainstorming, but done with the body. 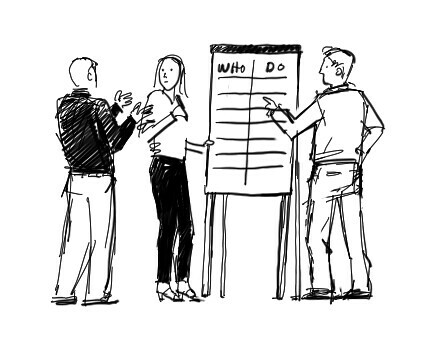 It may look different depending on the preparations and location, but in the end all bodystorming is fundamentally about one thing: getting people to figure things out by trying things out. A group may explore one of the techniques described below to get their feet wet with bodystorming. They may move through them in order, from observing and learning to ideation and prototyping, although this is not a strict sequence. Each level of bodystorming will help break the pattern of analyzing ideas around a conference table and get people closer to developing things that will work in the real world. Bodystorming takes place in three phases. going to a few campus locations and “blending in” with the surroundings while going about their usual work. It’s important that the group not zero in on any specific analysis so that they will be open to the cues that the environment presents. Use role play and props to develop an idea. In this exercise, a group physically “acts out” an experience by using whatever they have on hand or can acquire. The group focuses on how they interact with each other, their surroundings, and makeshift artifacts, testing existing ideas and uncovering new ones. For example, say a small group is asked to “reimagine the evening news.” Using each other as the actors, the audience, the news anchors, and the television itself, they improvise a script that plays out the experience as they conceive it could be. 1. Identify and assign critical roles. For any experience, identifying the “customer” or “user” role is a good way to get started. This participant (or group of participants) becomes the focal point and main character of the bodystorm. Other critical roles will present themselves. “Who wants to be the Internet?” is not an uncommon question to hear. more progress than “Yeah, but…” thinking. In some uses of bodystorming, a group will act out a script prepared in advance. In these cases, an equal amount of planning in props to build an environment is key. For example, if it’s a coffee shop, set up the counter and chairs. If it’s a park or outdoor area, strongly consider going there. The BetaCup Bodystorming Session – Overlap 09 from the betacup on Vimeo. By enacting the experience, the participants will naturally explore new possibilities, and uncover flaws or assumptions about how an idea could work. This is valuable both in the process itself and afterward: by documenting the exercise on video, the participants may later “watch the reel” to discuss key points. Choose the right level of bodystorming at the right time for the group. Because bodystorming asks participants to take a big step away from the typical conference table mode of thinking, they may need to get comfortable with more structured sessions first, armed with scripts and specific roles, before stepping into complete improv. In all cases, the exercise itself will be more memorable than the customary problem-solving session, and will help generate empathy that comes from “embodying” the experience. The term “bodystorming” was coined by Colin Burns at CHI ’94 In Boston, Massachusetts. The end goal of value mapping is to build a visual matrix that quickly and clearly defines areas of interest for something – it can be a service, a product, a plan, a website. It consists of asking people to choose a limited number of features from a bigger collection and then plotting their choices against a matrix. The result can be presented back in a template that resembles a light box, with items that were chosen more times being lit up by brighter colors and items chosen fewer times by weaker colors. 2. 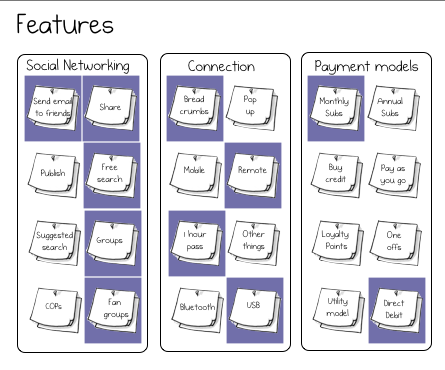 Play: show the collection of feature cards to participants, and ask them to choose a smaller number than the total, so that they need to make choices and leave some features out. A good ratio is 1:3, that is, if you have 30 cards ask people to choose only 10. Another way of doing this is to provide them with imaginary money – say £100 – and tell them they can use this budget to ‘shop’ for features. Keep a record of each participant’s choices. 3. Plotting results: color the cards on the original table according to the number of times they got chosen. Cards that were chosen more times can be colored with stronger or brighter colors, and cards that were chosen less times should be colored with light colors. Cards that were never chosen should remain ‘uncolored’. The matrix should now give you a good – and visual – idea of what areas were received with more interest, and which were not. Value mapping allows you to quickly visualize things that are valued by others – consumers, members of a team, your department, your stakeholders. Understanding general areas of interest can help focus the work (where should we concentrate our efforts?) and to settle internal disputes (“consumers really didn’t like any of the social networking features for this application, so we don’t need to invest in them now”). Try presenting the matrix in a series of slides that show different color groups – it really makes an impression!